Kids love to hear about beautiful stories. Books that cater to kids usually contain simple easy to read words that introduce them to early reading. Stories like the Little Blue Truck also helps develop a child’s imagination as he or she begins to picture out the story. 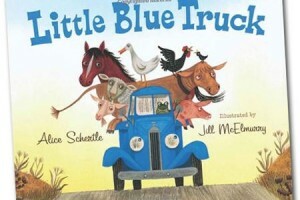 The Little Blue Truck is a board book story with unique characters that kids will find interesting. The story is about a blue truck and his friends as they face an everyday adventure that requires helping Little Blue out of a sticky situation. Little Blue is stuck in the mud while trying to help a fellow truck friend who as also stuck. It takes the help of friends to help Little Blue out of a bad spot. The Little Blue Truck is a book that comes with beautiful illustrations, zany characters, and rhythmic rhymes that make reading the story more interesting for the kids. The story encourages early reading skills, visual learning and teaches kids lessons about friendship. The Little Blue Truck is available for kids 7 years old and up at Fat Brain Toys for $7.